The Bitcoin Conference is fast approaching, and the Bitcoin community in the United States is getting ready for a fantastic experience. The Crypto Bit Bus offers ticket holders a chance to join their “favorite crypto friends” on a round trip journey to the Bitcoin 2019 Conference, with the hope of making the experience a memorable one for everyone involved. The Crypto Bit Bus is an epic voyage that will take off from Los Angeles and travel to San Francisco for the Bitcoin 2019 Conference. The Bit Bus will accommodate cryptocurrency enthusiasts in the United States, with the three-day trip expected to be full of crypto discussions, community building and networking, content creation, and interactions with some famous crypto personalities. According to the organizers, the available tickets are very limited, and the experience includes a round-trip journey on the Bit Bus, two nights stay at its partner hotel Americania and a ticket to the Bitcoin 2019 Conference. Are you ready for the EPIC “Genesis” voyage of the Bit Bus? Get to know your Bit Bus hosts! Ryan is a 🏘️ dealing, personal trainer🏋️‍♂️that can motivate a 🥔 into a 👑. He likes Property coin & enjoys resisting his girls baked goods! The Bitcoin 2019 team describes the conference as being a place to reignite the community by advancing shared goals. The event will bring together Bitcoin miners, core developers, company representatives, Bitcoin traders, investors, and more. The theme of the Bitcoin 2019 Conference is the Nakamoto Consensus. The event will have a multifaceted cast of speakers sharing their own unique differing views on the crypto industry, but who are nonetheless all working towards the same shared goal of ensuring its success. Several keynote speakers have already been identified, and based on the list presented on its website, the event looks set to be action-packed. Some of the speakers at the event include; Anthony Pompliano (Founder & Partner, Morgan Creek Digital), Erik Voorhees (CEO & Founder, ShapeShift), Jihan Wu (Co-Founder, Bitmain), Stephen Pair (CEO of BitPay), Austin Alexander (Senior Vice President, Kraken), and many others. 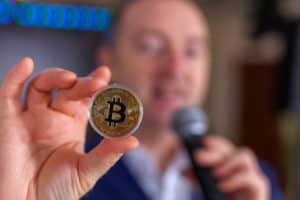 The speakers listed above are some of the biggest names in the cryptocurrency space, and their thoughts on the Nakamoto Consensus will be very inciteful for the community. The conference will be focused on expanding Bitcoins potential, accelerating adoption, facilitating inter-industry collaboration, refocusing on its philosophy, and galvanizing its community. According to the organizers, this is the first time the event has returned since it previously took place in 2014 and 2013. The original Bitcoin Conferences were a place where early adopters of BTC would come to share their enthusiasm, technical concerns, and ideas about the future of the crypto space. This year, the topics will also be focused on the future of Bitcoin and its role in the global financial landscape. Bit Bus Offers a Unique Trip to the Bitcoin 2019 Conference With Your Favorite Crypto Friends was originally found on copy trading cryptocurrency | Tech, Privacy, Bitcoin & Blockchain | Blokt.